Ojo is an unlucky Munchkin boy who lives alone, in the forest with his Uncle Nunkie. 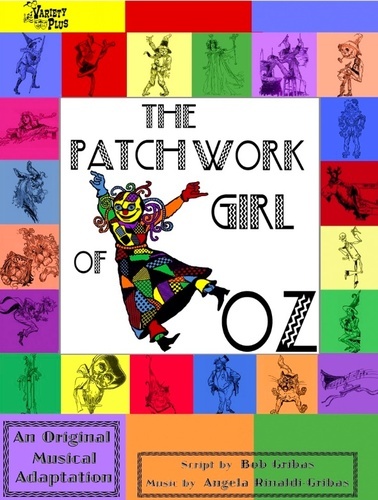 One day, they go to visit the Crooked Magician where they witness the creation of The Patchwork Girl. An accident causes a potion to spill, petrifying Ojo’s Uncle and the Magician’s Wife. So, Ojo must travel throughout the land of Oz to find the ingredients for the potion to set his Uncle free. The Munchkin boy is helped along on his journey by the Patchwork Girl, a Glass Cat, a living Victrola, a Wood Chopper, a Foolish Owl, a Wise Donkey, a Wild Woozy, a Shaggy Man, the Scarecrow, a stuffed Gump, a talking Hen, Jack Pumpkinhead, the Tin Man, the Cowardly Lion, the Hungry Tiger, Princess Dorothy and the Wizard of Oz. Through his travels, Ojo meets many of the people and creatures of Oz; including a bullying Giant Porcupine, the fashionable citizens of the Emerald City, some very lazy Quadlings and the jolly, though mischievous, Hottentots. Ojo and his friends barely escape a field of giant Plant/Traps. They help prevent a war between the bouncing Hoppers and the burrowing Horners. They nearly end up a meal for the Giant Yoop and, somehow, escape his henchmen, the Hammerheads. In the end, with the help of Glinda, the Good and Ozma of Oz, Uncle Nunkie is freed of the spell and Ojo goes from an unlucky Munchkin to the luckiest boy in Oz.